I very recently acquired this spoon. It has no marks, not even rubbed marks (I scoured every inch). It is in crisp condition with very minimal signs of wear. It is definitely silver but my gut tells me that it is not particularly old considering the condition. Wasn't sure if anyone can shed any light on it or even just some information on William & Mary spoons in general. I've read OEL's post on Geboortelepels which is the only reason I even have a vague idea what it is lol. The engraving looks like it reads "Van Der Poll 1768 / Klaaske Waters" which Google says means Clear Waters. In Dutch, we call this a zilveren Friese sierlepel or silver Frisian ornamental spoon or silver commemorative spoon. The engraving could read: Jan van (faded/rubbed) der Pol 1768 Klaaske Waters. Klaaske is a Frisian girl’s name. Perhaps Jan van der Pol married Klaaske Waters in 1768. 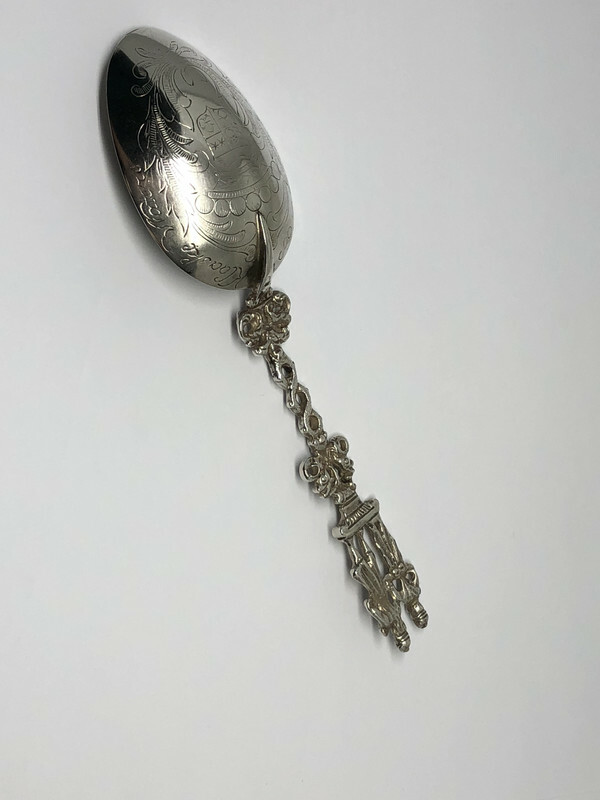 18th Century Commemorative spoons were not often used as an eating utensil but used as a showpiece in a display cabinet, and many of those spoons have remain pretty good through time. It’s not unusual to see Frisian spoons without town mark or assay marks, maker’s mark only or without any marks. I believe the family name Waters to be of British origin which could explain the William & Mary theme. Thank you for the information, I was hoping you (as the resident Dutch silver expert) would be able to shed some light on the piece. 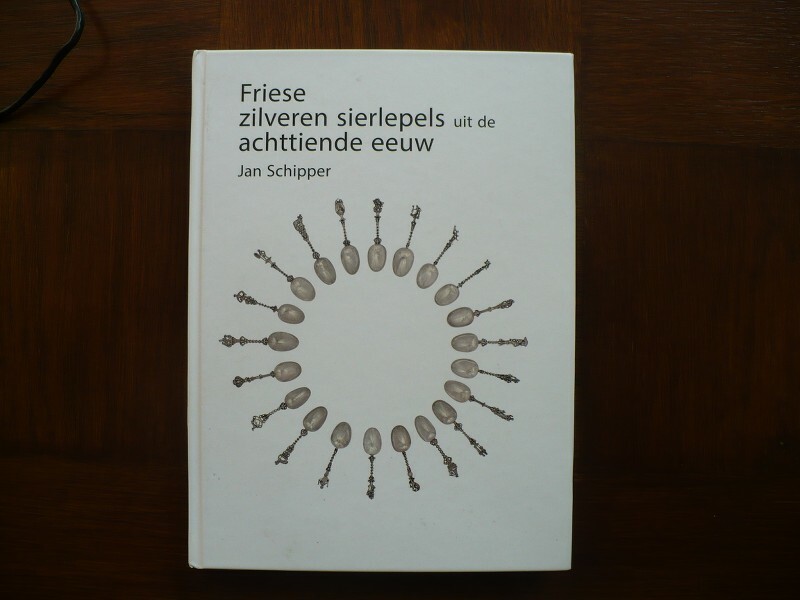 I love these "zilveren Friese sierlepel" they are fun to collect and since I have Voet's book on Frisian makers, if there is a marker mark I can sometimes find them. 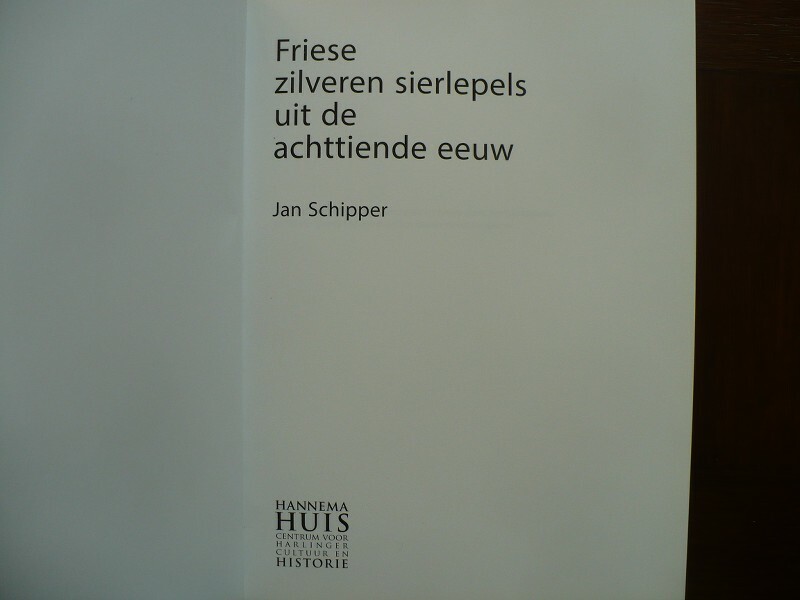 I am curious though if there is a book on just "zilveren Friese sierlepel". I've looked but I did not know that was what they were called till just now. Also I'll try looking to see if I can find a Jan der Pol but there is definitely nothing rubbed on the engraving, the spoon is super crisp and sharp which is why I had my doubts. Also on a separate note do you have any zilveren Friese sierlepel? I would love to see them if you have the time to share. I'm trying to learn as much about these spoons as possible. Your welcome and I have better information. The inscription reads: Klaaske Waters Van Der Pol 1768. The name and family crest are fantasy and probably engraved 19th/early 20th century. If the spoon itself is much older is hard to tell, probably not 18th century. Will be home later today when I will be able to show you some images with extra information to answer your other questions. That was my feeling as well, the spoon is in far too good of condition. It hasn't even tarnished/patined entirely. It's probably even newer than early 20th century. But any other information you have will be much appreciated. I still think the spoon is fun and whoever engraved it did a beautiful job. I'll see what I can find on the name in the meanwhile. 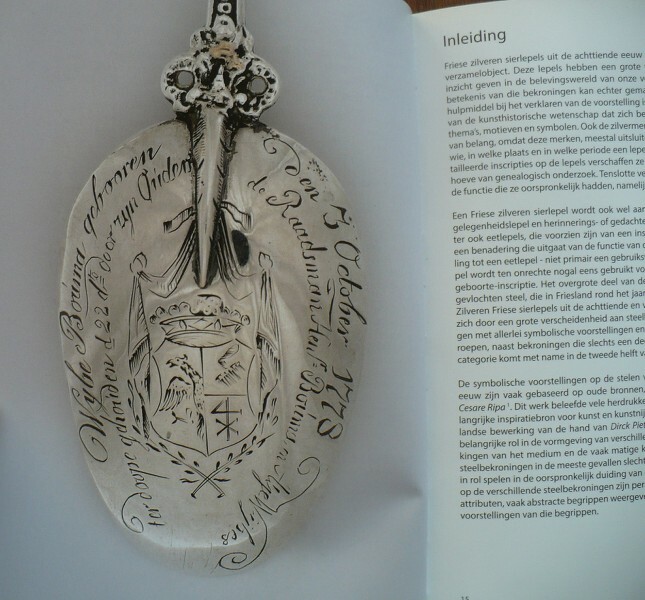 The best book about Frisian ornamental spoons is written by Jan Schipper; Friese zilveren sierlepels uit de achtiende eeuw, 122 pages with multiple images of Frisian ornamental spoons of the 18th century. The book is published by Hannema huis centrum voor Harlinger cultuur en historie. Here you can order your copy of this excelent book. Thank you so much, I will definitely contact them and see about how I can go about ordering it. That is exactly what I am looking for.